Students walked out of class Nov. 15 in protest of Trump's policies. Twenty-five student organizations' formed an anti-Trump coalition, which members said organized the protest, but disbanded soon after. Student organization leaders briefly started an anti-Trump coalition after the presidential election, but the group recently parted ways after a disagreement over whether or not to include a nonviolence clause in the group’s mission statement. On Nov. 10, members of at least 25 student organizations came to the first meeting for the group, collectively called the GW Coalition for Intersectional Justice, according to meeting minutes obtained by The Hatchet. But the group fractured in their second meeting Nov. 20 when some student leaders opposed mandating nonviolence, which kept protesting students from burning flags and practicing self-defense in potential altercations with President Donald Trump’s supporters. Of the 25 organizations represented at the first meeting, seven either declined to comment or denied involvement and 14 did not return requests for comment. Jesus Montes, the director of communications for the GW Mexican Students Association, said he attended the meetings in District House with about 50 other student organization leaders interested in co-sponsoring protests and events protesting Trump. “The Mexican Student Association wanted to participate to convey disagreement on how the new administration was going to act towards undocumented individuals, especially DACA students who are enrolled in GW,” Montes said. DACA, or Deferred Action for Childhood Arrivals, is a policy that allows undocumented citizens who came to the U.S. as children to request a postponement of immigration for two years. The coalition planned to host “teach-ins” in Kogan Plaza about concerns students have over the Trump administration and other events and protests, according to a meeting agenda obtained by The Hatchet. The first meeting turned sour when a member of the Mexican Students Association proposed adding a nonviolence clause to the group’s mission statement, Montes said. He said the Mexican Students Association’s executive board had discussed the idea before coming to the meeting. The suggestion opened up a series of debates, with some attendees saying student protesters should be able to use self-defense if, for instance, a Trump supporter struck them during an event – something that happened during some campaign rallies when Trump was a candidate. Other student leaders countered that not adding the clause could open the coalition up to receiving potential blame if an unaffiliated, random person became violent and their actions were blamed on the group, Montes said. Vandalism, like breaking windows, was not proposed in the meeting, although there was discussion of burning the American flag, which the Mexican Students Association and other groups did not support, he said. The group organizers were responsible for a University-wide walk-out Nov. 15, a protest discussed in the coalition’s first meeting, Montes said. The event began in Kogan Plaza and ended at the White House and included about 400 students. The walk-out was co-sponsored by at least 12 student organizations, including the Feminist Student Union, the Progressive Student Union and Fossil Free GW. The coalition was never officially listed as an organizer of the protest, and only seven of the 12 co-sponsoring organizations were represented at the first group meeting, according to meeting minutes obtained by The Hatchet. After the initial disagreements among student leaders, at least 38 students attended a second coalition meeting Nov. 20, during which members voted to adopt the name “GW Coalition for Intersectional Justice,” according to documents obtained by The Hatchet. Members also drafted the mission statement during the meeting, stating that the group “rejects the past, present and future normalization of discrimination and violence in all forms against marginalized people,” according to meeting minutes. Although not explicitly in the mission statement, a note regarding the need for “nonviolent active resistance” appeared in a subsection of the statement. Montes said the group began to dissolve during the final exam period in December. The Mexican Students Association remained in contact with coalition leaders during that time, but official meetings stopped, he said. Henry Klapper, the president of the Progressive Student Union and a former Hatchet reporter, said his organization is not currently with the group. Coalition meeting minutes listed PSU as one of the 25 organizations represented. 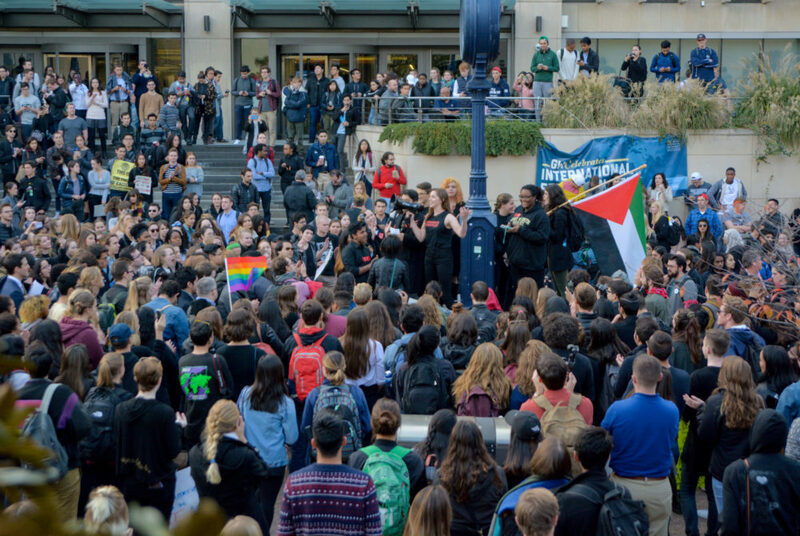 “As far as we know, that coalition isn’t active any longer, though we continue to commit to stand in solidarity with all student groups and individuals who are threatened by the hateful policies of the Trump administration,” Klapper said.